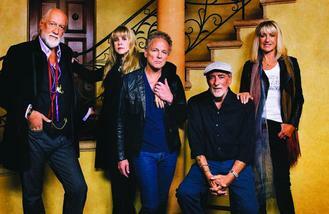 Fleetwood Mac are "highly likely" to headline Glastonbury 2016. The 'Go Your Own Way' hitmakers - who topped the bill at the Isle of Wight Festival last year - are reportedly close to signing up to perform at the world Michael Eavis' iconic festival on Worthy Farm in Somerset, South West England. A source told the Daily Mirror newspaper: "Glastonbury was always on the cards and they wanted to do it last year but they couldn't because of the deal they have signed with Isle of Wight organisers. Now they are free of that they can do what they want." And it was IOW boss John Giddings who reminded Glastonbury founder Michael Eavis that money talks, when he revealed he had to splash the cash to secure Fleetwood Mac - comprised of Mick Fleetwood, Stevie Nicks, John McVie, Christine McVie and Lindsey Buckingham - last year. He went on: "Glastonbury are in a privileged position whereby they sell out in advance. They could book my granny and still have a festival. The rest of us are still in the realms of having to book a decent line-up and make it attractive to people and make them want to come." Meanwhile, Coldplay are being hotly tipped to become record makers in 2016 and become the first ever act to headline Glastonbury four times. The band - fronted by Chris Martin - previously closed the Pyramid Stage in 2002, 2005 and 2011. Justin Bieber left the audience shocked when he stormed off stage during a concert in Norway, annoyed at fans for not listening to him. Kylie Minogue will kick start the Christmas festivities in London by switching on Oxford Street's iconic Christmas lights on Sunday. One Direction, Little Mix and Jess Glynne and more have been confirmed to perform at this year's BBC Music Awards. Adele scrapped an entire album about being a mother after deciding it was far too boring. Rammstein will headline Download Festival 2016 alongside Iron Maiden and Black Sabbath. Watch Adele's Video For New Single Hello. Kanye West releases two surprise tracks: A remix of 'Say You Will' and The Weeknd sampling 'When I See'. Glastonbury 2016 headliner: Ed Sheeran says he won't be topping the bill until he has 'at least three or four albums'. X Factor fans were left in shock when Adele teased a 30-second snippet of one of her new song during the show’s ad break.